Polished to stunning elegance, FOX Chrome Steel Grinding Balls are the Rolls Royce of the grinding ball industry. A dynamic and reliable steel ball, the intelligent design of this ball mill media is owed to our breakthrough technology, which enables us to take the finest chrome steel and vacuum-de-gas it. 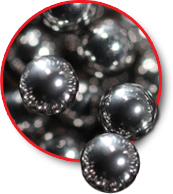 Because this process sets free all trapped air in the formulation, our chrome balls are produced with no air pockets—which results in a fully solid metal ball. 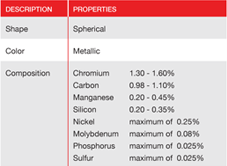 So, the chrome steel balls in your ball mills grind your product—not each other. FOX Chrome Steel Balls will transform your ball mill operation into a lean, mean, grinding machine.